I am Professor of Soft Matter Physics in the Department of Physics and Astronomy at the University of Sheffield. My research interests centre around the physics of polymers at surfaces and interfaces, heterogeneous media (gels), semiconducting polymers, biophysics, and soft nanotechnology. On January 14, 2016, four of my research students received their PhDs from the University of Sheffield. Seeing one of your students graduate is a very proud moment for any supervisor but to have four at the same ceremony is very unusual. 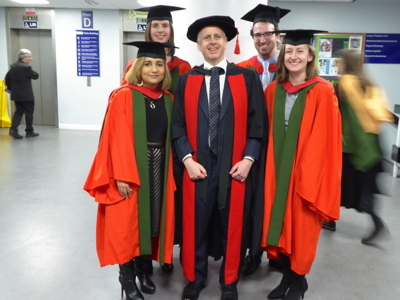 Maryam Raftari (front left), Sarah Canning (front right), Amy Hall (rear left), and Chris Clarkson (rear right) have all had very different journeys in obtaining their doctorate, but the goal of a Sheffield PhD is the same and they all deserve plaudits for what they have achieved. Whilst they are each wearing the doctoral dress of the University of Sheffield, I am wearing my own doctoral gown, which is that of the University of Cambridge. Maryam is currently very ill. If you wish to help, further details are available. Research highlights from my group include the directed diffusion of single polymer molecules as well as work on the switchable adhesion of oppositely charged polyelectrolytes. Single polymer diffusion & switchable adhesion. I have recently written a book on polymer electronics with my colleague Georges Hadziioannou of the University of Bordeaux. Polymer Electronics book & Georges Hadziioannou. I am also a co-author and co-editor of Nanoscale Science and Technology, a textbook introducing nanoscience and nanotechnology to final year undergraduates and graduate students. This book provides core material for graduate-level training courses, including our own. Nanoscale Science and Technology book. 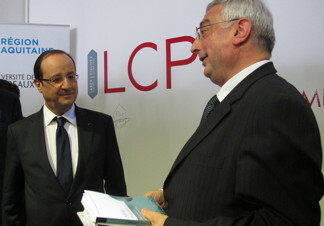 Right: The French President, M. François Hollande (left) visited my colleague Georges in Bordeaux in January 2013, whereupon Georges presented him with the first copy of our book, Polymer Electronics. I had to wait until April, like everyone else, to get my copy.